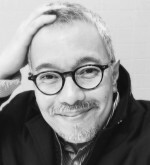 RALPH B. PEÑA is the current Producing Artistic Director of Ma-Yi Theater Company. Recent directing credits include Among the Dead, House Rules (Ma-Yi) The Orphan of Zhao (Fordham Theatre), Macho Dancer: A Musical (Cultural Center of the Philippines), Livin’ La Vida Imelda (Ma-Yi), Lloyd Suh’s The Wong Kids in the Secret of the Space Chupacabra GO! (Cultural Center of the Philippines, Children’s Theater Co. and Ma-Yi, Off Broadway Alliance Award), Julia Specht’s Down Cleghorn, Joshua Conkel’s Curmudgeons in Love (EST Marathon), Mike Lew’s microcrisis(Youngblood, Ma-Yi), and House/Boy (Dublin and Singapore Theater Festivals). His theater work has been seen at The NYSF/Public Theater, Long Wharf Theater, Laguna Playhouse, NAATCO, Second Generation, Victory Gardens, and LaMama ETC, among others. He received an Obie Award for his work on The Romance of Magno Rubio. Ralph is a member of the Ensemble Studio Theater. He is the author of FLIPZOIDS (OBIE Award), CINEMA VERITE, THIS END UP: A USER’S MANUAL FOR LOVERS OF ASIANS, PROJECT: BALANGIGA (co-written with Sung Rno), DEAD MAN’S SOCKS. Ralph was born in Manila, the Philippines, to Alfonso S. Peña, and Josephine D. Bayron. He spent his younger years in Manila, and California, before moving permanently to the U.S. in 1984. During his time in the Philippines, Ralph helped found a street performance company called Bodabil, later renamed UP Peryante. The group, led by Chris Millado, used vaudeville as a form of protest theater against the Marcos dictatorship. Ralph co-founded Ma-Yi Theater Company in New York City, in the summer of 1989, along with colleagues from the Philippines. He became Ma-Yi Theater’s Artistic Director in 1996. Since then, and in partnership with Jorge Z. Ortoll, Ma-Yi’s former Executive Director, Ralph has worked to make Ma-Yi Theater Company one of the country’s leading venue for new Asian American Theater. Ralph was one of the lead organizers of the first U.S. Artist delegation to the 7th World Social Forum in Nairobi, Kenya.